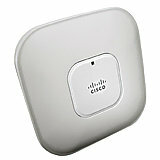 Cisco - AIR-LAP1141N-A-K9 CISCO - AIRONET 1141 - WIRELESS ACCESS POINT 802.11G/N FIXED UNIFIED AP INTERNAL ANTENNA INCLUDE(POWER SUPPLY AIR-PWR-A OPTIONAL) ANT. FCC CFG(OPTIONAL POWER SUPPLY).NEW FACTORY SEALED.IN STOCK. SHIP SAME DAY.